Leslie Gilbert-Lurie, a writer, lawyer, teacher, and child advocate, is a board member and Immediate Past President of the Los Angeles County Board of Education. She is a founding member and past president of the Alliance for Children's Rights, a non-profit legal rights organization for indigent children, co-chair of the education committee for the Los Angeles Music Center, and a board member of Sierra Canyon School and New Visions Foundation. She recently served on the mayor's task force charged with developing a new cultural plan for the City of Los Angeles. Gilbert-Lurie, with her mother Rita Lurie, is the co-author of the mother/daughter memoir Bending Toward the Sun (Harper). As the head of comedy and NBC Productions at NBC Gilbert-Lurie spoke to many gatherings of advertisers and the media. As the President of the Los Angeles County Board of Education and the chair of the Alliance for Children's Rights board, she has spoken at numerous education events, graduations, and large charity dinners, in addition to conferences, organizations, and events for children's rights, education and the Holocaust. Gilbert-Lurie has also spoken at many Los Angeles schools on the subject of the Holocaust. A decade-long collaboration between mother and daughter, Bending Toward the Sun reveals how deeply the Holocaust still lives in the hearts and minds of survivors, and even extends into the lives of their descendants. Rita and Leslie bring together the stories of three generations of women -- mother, daughter, and granddaughter Mikaela -- to understand the traumatic legacy that unites them all. In her unique memoir and presentations, Gilbert-Lurie offers an incredible emotional and historical sweep, sure to touch anyone who has ever sought reassurance and hope following a traumatic experience. Previously, Gilbert-Lurie spent close to a decade as an executive at NBC, where, at various times, she oversaw NBC Productions, Comedy, wrote television episodes, and co-founded a new NBC in-house production company, Lurie-Horwits productions. As a lawyer, she worked briefly at the law firm of Manatt, Phelps, Rothenberg and Tunney and served as a Ninth Circuit Court of Appeals Law Clerk. 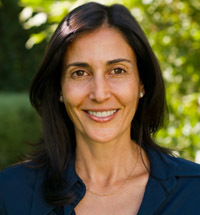 Gilbert-Lurie is a graduate of UCLA and UCLA School of Law. She lives in Los Angeles with her husband, son, daughter, and step-son. "Bending Toward the Sun is like a great episode of Law & Order -- a riveting story where the stakes are life and death, insoluble moral dilemmas and an ending that is both upsetting and uplifting. Bolstered by writing that is compelling and sensitive, the book transcends the holocaust genre with its multi-generational point of view on the ultimate effect of fear and evil on young minds." "This book is heartbreaking yet inspiring, a story told by three generations--the grandmother, who is a child survivor, the mother, a successful American professional, and the daughter, full of talent, promise and hope. At its core, this book is a study of how the Holocaust experience wraps itself around each woman - creating extreme fear of separation, setting off depression, filling mind and memory with haunting evil and indefinable ghosts. Yet it also tells us of hard won wisdom for living distilled from pain and loss, of life force driven by the will to overcome suffering, of Jewishness lost and Jewishness reborn, of unquenchable love--all passed on and shared between the generations through the filter of the Holocaust. Gripping, exhausting, exciting, devastating--this book is at times hard to read but always impossible to put down. " "Here is a memoir that takes us through many worlds, through heartache and noble hopes, through the mysteries of family love and toward a beautiful, light filled conclusion. Read Bending Toward the Sun and enrich your life." 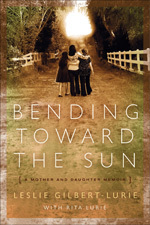 "Bending Toward the Sun is a captivating memoir that explores a complicated, loving, and enduring mother-daughter bond, and reveals how doubts, hopes, and dreams are handed down from generation to generation. As both a mother and a daughter, I found it deeply touching." "Their stories are told, each in her own voice, in this fascinating memoir. The women's personal stories are both compelling; Gilbert-Lurie was behind many of the most popular TV shows of recent years, and she knows how to tell a story." "[An] affecting memoir...Vivid...Riveting...An amazing story of wartime survival." "The lasting impact of the Holocaust on a survivor and her daughter emerges in this joint account. . . . The voices and experiences expressed are valuable."